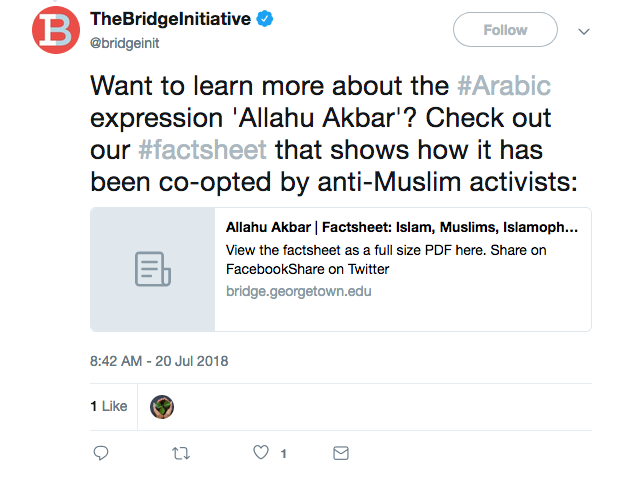 The “factsheet” (in reality a deception sheet) that Bridge Initiative linked contains numerous false claims, including: “The phrase is ‘recited by Muslims and Arabic speaking Orthodox Christians as an expression of their faith. '” Although there are quotation marks in the Bridge “factsheet,” there is no indication of who is being quoted, and whoever is being quoted is a liar. And that’s just going back two months. I could go on and present hundreds of examples of Muslims screaming “Allahu akbar” while committing acts of violence against non-Muslims. But for the Bridge Initiative, the problem is not those Muslims. For them, the problem is the non-Muslims who dare to point out the obvious connection between “Allahu akbar” and violence. They’ve “co-opted” the phrase, and are “anti-Muslim,” you see. As far as the Bridge Initiative is concerned, if non-Muslims would stop reporting on how violent Muslims scream “Allahu akbar,” all would be well. The problem is not the reporting, not the stack of dead bodies. If I had a college-age daughter, I would no more send her to Georgetown University than I send her to work in a whorehouse in Buenos Aires. The British Surrender - Yellow Bellies! !